Every year, thousands of vacationers flock to the Smoky Mountains for action-packed days exploring local attractions and downtown Gatlinburg. You can stay close to the heart of it all with our Elk Cove Resort cabins in Gatlinburg, TN. Our secluded cabins offer guests both a peaceful rental surrounded by nature as well as a great location only minutes from great attractions. All in all, Elk Cove Resort cabins are a great fit for your vacation in the Smoky Mountains! With all of these comfortable amenities, possibilities for fun and relaxation in your Gatlinburg cabin abound. Imagine enjoying a secluded, wooded setting while you relax in a hot tub! At dinnertime, prepare a delicious meal with your grill and in-cabin kitchen. Meanwhile, the kids could blow off some steam in the cabin game room with the pool table and arcade games! Or if you are planning a gathering of friends, you could enjoy some friendly competition at the billiards table. All of these excellent amenities better allow your family or group to play, laugh, and relax while enjoying the mountains in comfort and style! These luxury log cabin rentals in Gatlinburg are just the ticket for your stay in the Smokies. Better yet, when you book online, you will receive 15% discount off of your vacation rental! Our cabin discount allows you and your family to enjoy a luxury cabin experience without the luxury Gatlinburg cabin price. 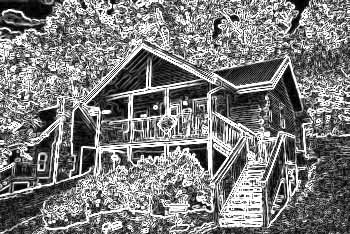 Book an Elk Cove Smoky Mountain cabin today and save! A private cabin called "Hemlock Hideaway" in Elk Cove Resort. Book your family fun Gatlinburg cabin rental with WiFi, hot tub, game room and more!